The thermal properties of glass articles as well as the behaviour of the melt at high temperature are of great importance for CFD modelling and for the correct management of the glass production process (boosting management, gob temperature, annealing curve). Stazione Sperimentale del Vetro is an internationally recognized center of excellence for the measurement of thermophysical properties of glass, and is one of the few in the world to be equipped with the scientific instrumentation and expertise necessary for an integrated and complete characterization of the following properties: viscosity, density and electrical resistivity at high temperature (up to 1650 ° C), thermal expansion curves, determination of the softening and annealing points. The viscosity behavior of glass at high temperature is of fundamental importance for crucial aspects of the production process such as melting, refining and forming. High temperature viscosity is measured in a calibrated furnace exploiting the principle of the rotating rheometer: a platinum rotor is immersed into the molten glass (contained in a Pt crucible) at a given temperature, and the torque required to keep the rotor rotating at a constant speed, which is a function of the viscosity of the molten glass, is measured. The high temperature surface tension of glass is a crucial parameter for assessing its aggressive behaviour towards the soldier blocks, especially since it determines whether the glass will produce generalised and congruent corrosion, or localised corrosion along the metal line (due to the Marangoni effect at the triple point interface), generating the characteristic “coup de sabre”. Furthermore, surface tension is a property of paramount importance in the case of glass fibres, as it has a fundamental impact on the operational parameters of the production process, on the possibility and method of drawing the melt into fibres, etc. The determination of the surface tension at high temperature is carried out following a method specifically optimized internally by SSV. For more information, contact our experts. The softening point of Littleton is the temperature at which the viscosity of the glass is equal to 10^7.6 poise, and represents the point at which the glass begins to lose its shape under the effect of its own weight. The determination of the softening point is carried out following the indications of the ASTM- C 338-93 standard, measuring the elongation under its own weight of a fiber of standard size obtained from the glass sample. Annealing and Strain points are defined as the temperatures at which the residual stresses in the glass are completely relaxed in times of the order of hours or days respectively, and represent two parameters of fundamental importance in defining the annealing cycle of glass articles. They are determined according to the ASTM-C-336-71 standard, by measuring the elongation of a standard size fibre under the tensile strength applied by a calibrated weight. 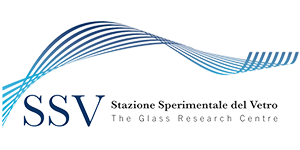 The glass transition temperature indicates the interval of temperatures corresponding to which the behaviour of the glass changes from viscoelastic (plastic and tough) to purely elastic (rigid and brittle). Its determination is made on the basis of the measurement of the dimensional change of a sample of standard size as a function of temperature, and corresponds to the range of T for which the resulting curve has a characteristic change in slope. The electrical conductivity of glass is a crucial parameter for optimising the electrical boosting or for setting up electric furnaces. It is measured in a calibrated furnace using a pair of suitably shaped Pt electrodes, consisting of a hemispherical cup containing the molten glass and a hemispherical bulb which is immersed inside the molten glass during the measurement. The resistivity of the glass is measured at temperatures between 600 and 1600°C, with the passage of alternating current at various frequencies. Determining the functional dependence of glass density from temperature is important for fluid dynamic simulations (CFDs) of the glass melting process, and is done using the Archimedes principle: the weight of a platinum sphere immersed in molten glass within a calibrated furnace is determined at various temperatures (typically between 1000 and 1600°C). Moreover, if the measurement is carried out under dynamic conditions (increasing T), it is possible to identify the temperature at which bubbles begin to develop due to the saturation of the solubility of the gases in the glass (an effect called reboil). The phononic thermal conductivity of glass is evaluated from room temperature up to 180°C using the hot disk method. This analysis consists in determining the characteristic relaxation times as a function of the temperature of a glass fibre subjected to torsional stress. The determination of the devitrification curve of a given glass allows to evaluate its degree of instability and to identify the critical temperatures for the nucleation and growth of crystals, so it is crucial, for example, in the field of glass ceramics, or in case of crisis of defects in the finished products. The test is carried out with the help of a specially calibrated gradient furnace, and the evaluation method has been optimized internally by SSV following the indications of the ISO standard of reference. The test can also be integrated with an XRD mineralogical analysis, aimed at identifying any crystalline nucelated phases. This property is important when glass is to be bonded to another material, or to evaluate its resistance to thermal shock; the average CTE is determined by measuring the elongation of a standard glass sample between room temperature and another fixed temperature (e.g. 200°C, 300°C or 400°C).